I haven’t stopped thinking about community, thinking ever deeper about what it means to be the body of Christ. I’ve been turning this over in my head for a while, striking up conversation with (slightly- ’cause if you know me then you know what talking to me can be like) unexpecting people, blogging about it, digging into scripture, asking God to show me His truth… and repeat. Because here I am, blogging about it again. I thought I might, but then the day got away from me. I’ve had a bad headache, almost like I can’t think straight. But God is keeping this topic on the forefront of my mind, no matter how scattered my thoughts have been. So, yet again, I find myself typing a blog post pretty late on a Wednesday. I went to leave camp this afternoon for a few errands and such. 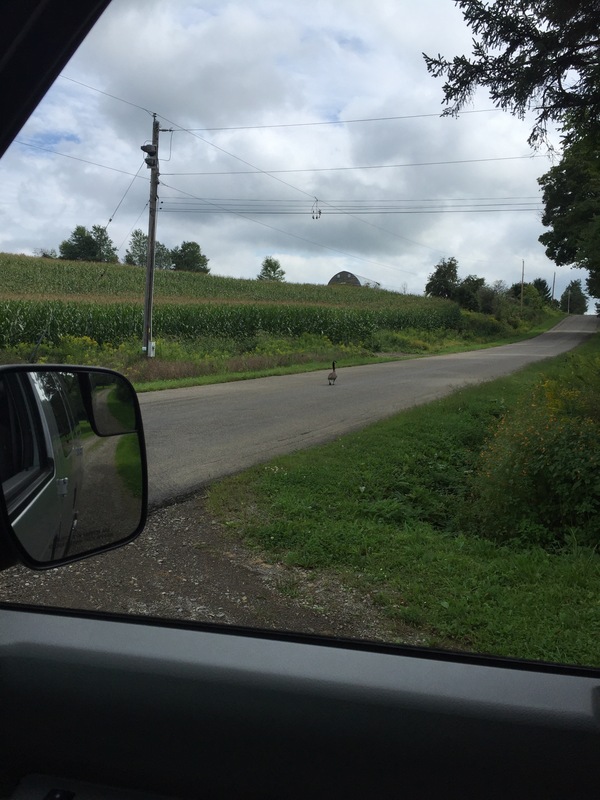 My eldest son was waiting for me outside and he was a little excited as he shared the story of walking outside to our van only to be surprised by a goose sitting on the camp road. 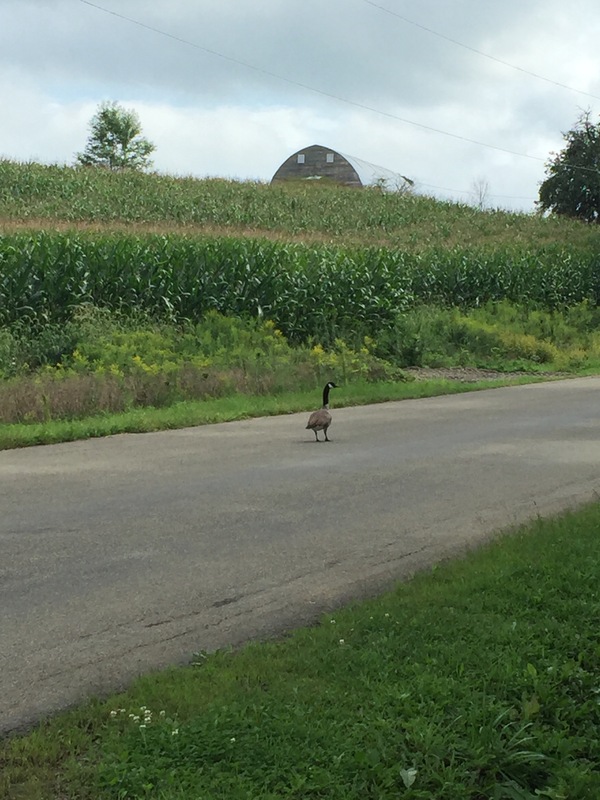 The goose skedaddled down the road and sat near the edge of the field by the main entrance to camp. Seeing geese here at camp isn’t usual. We have a few resident geese on the lake along with flocks en route south as autumn approaches. But I cannot recall ever seeing one alone much less up by the house. Yet, here was a goose all by its lonesome. And it looked lost. As it walked it looked left, then right, left, and right again. I thought that goose was reevaluating some recent decisions and wondering how it ended up so far from friends/family and no where near the water. Then it started walking down Sandbank Road. Next fall when you see geese heading south for the winter, flying along in “V” formation, you might consider what science has discovered as to why they fly that way. As each bird flaps its wings, it creates an uplift for the bird immediately following. By flying in “V” formation, the whole flock adds at least 71 percent greater flying range than if each bird flew on its own. People who share a common direction and sense of community can get where they are going more quickly and easily, because they are traveling on the thrust of one another. When a goose falls out of formation, it suddenly feels the drag and resistance to trying to go it alone. And quickly gets back into formation to take advantage of the lifting power of the bird in front. If we have as much sense as a goose, we will stay in formation with those people who are headed the same way we are. It is sensible to take turns doing demanding jobs, whether with people or with geese flying south. fallen goose until it is able to fly or until it dies; and only then do they launch out on their own, or with another formation to catch up with their group. I love it when we can see parallels in creation to truths of our Creator. We were meant for community. And so, my friends, I will write another post about that tonight. Ephesians 4 has been the scripture passage I’ve been studying for a while now, but even more so this week. 4 Therefore I, a prisoner for serving the Lord, beg you to lead a life worthy of your calling, for you have been called by God. 2 Always be humble and gentle. Be patient with each other, making allowance for each other’s faults because of your love. 3 Make every effort to keep yourselves united in the Spirit, binding yourselves together with peace. 4 For there is one body and one Spirit, just as you have been called to one glorious hope for the future. 9 Notice that it says “he ascended.” This clearly means that Christ also descended to our lowly world. 10 And the same one who descended is the one who ascended higher than all the heavens, so that he might fill the entire universe with himself. 20 But that isn’t what you learned about Christ. 21 Since you have heard about Jesus and have learned the truth that comes from him, 22 throw off your old sinful nature and your former way of life, which is corrupted by lust and deception.23 Instead, let the Spirit renew your thoughts and attitudes. 24 Put on your new nature, created to be like God—truly righteous and holy. 25 So stop telling lies. Let us tell our neighbors the truth, for we are all parts of the same body. 26 And “don’t sin by letting anger control you.” Don’t let the sun go down while you are still angry, 27 for anger gives a foothold to the devil. 30 And do not bring sorrow to God’s Holy Spirit by the way you live. Remember, he has identified you as his own, guaranteeing that you will be saved on the day of redemption. Just as geese benefit from flying together, so to do we benefit from submitting to one another as the body of Christ. We each have a role and as each one does their part, the whole body will benefit: we will be mature in the Lord. Verse 16 speaks right to the heart of the matter: Christ makes the whole body fit perfectly together. Tonight, that is my prayer, Christ be at work in us. Help us to submit to your leadership so that we may fulfill the role you have for us as your church, as your body. May we come to understand how to speak the truth in love. That we are not just resounding gongs or clanging symbols. Strengthen us to do the special work you planned in advance for each of us to do. Jesus make us your body, healthy, growing and full of love. Church… our… yes, our youth need us to be the body Christ. We need to be there, together, to be there for them and allow them to be there for us. We are meant to be community. The hope for the goose was that another skein would fly over and pick him up. And I think of our teens, the pressure, struggles, and lies that they face. Friends we need to step up and be there for them: teach them of the beautiful, life-changing message of the gospel, share with them our testimonies of God at work in our lives, support their development as believers, offer them inroads to putting their God-given gifts and talents into practice in the body of Christ, and guidance when they stumble and fall away. Is God calling you to step up in doing your part? Who has God placed in your life for you to help grow? Maybe it is an unexpected person or in an unexpected way. How is all of this speaking to you? Share with me, send me a message, email or phone call. I’m interested in hearing how the Spirit is at work in your life! Hi Jill. I have been struggling with a situation at work. A 20something I work closely with is having trouble at college. Yesterday I spoke to her about “selling herself short” taking the easy way out.I felt guilty about what I said after as truly iit is none of my business. However after reading your blog I feel that from my life experience and habit of selling short, I might have a prospective that God wants me to share with her. I keep this young woman in my prayers, she has so much to give &I see her selling short her dreams. I want to encourage her with the promises &hope of Christ to be patient &wait on the Lord’s time. After reading this scripture I am encouraged to be a small voice that says to her ‘keep fighting!’. As always thank you for words of encouragement.